Renovating your home is an exercise that can be daunting and exciting in equal measure. Exciting because it promises a reinvigorated home that is remodelled to suit your needs and preferences. Daunting because starting a renovation can also leave you anxious and scared about the eventual outcome. Questions like ‘Will it turn out well?’ or ‘Can I afford it if something needs to be redone?’ start rearing their ugly heads and can leave you in a bind. The number of ifs and buts when it comes to home renovation can be unending. So what is the way out here? 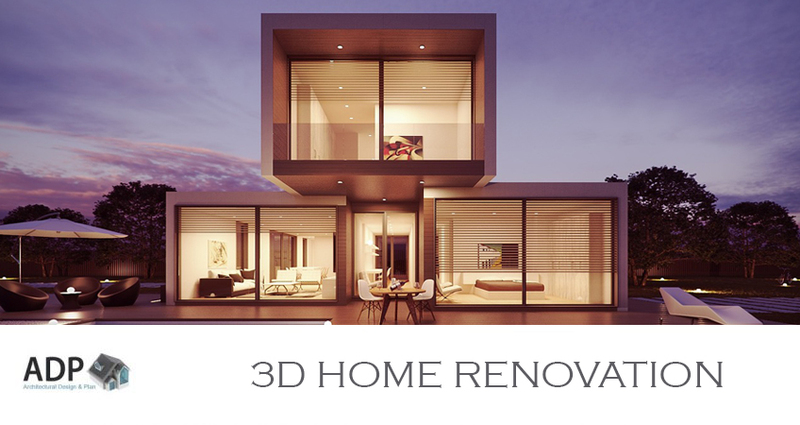 Enter 3D home renovation software. You might want to renovate just a part of your home or even go the full monty, 3D rendering helps you make the right decisions. The technology is irreplaceable for architectural designers and professionals as it lets them fine-tune all measurements and rectify any problems before the construction begins. For homeowners, 3D rendering offers the best opportunity to understand and get a feel for their new home design. Instead of trying to imagine the distance between your kitchen and bedroom, just fire up the 3D rendering and get your answer. Want your living room windows bigger? Right away. Want to see the view outside that window? Go right ahead. Had a change of mind and don’t want the window anymore? Just a minute. The other reason why 3D visualisation is such an integral part of an architectural design is that, well, architects and designers love it. The software allows them to include their clients in the overall design process. By understanding your needs and preferences quickly, architects and designers can invest more time and energy into the actual design process. It also needs to be said that people find it easier to articulate their home renovation needs and preferences through a visual medium. For instance, home construction and remodelling involve a lot of technical terms which can be hard to understand for the average homeowner. When choosing an architect, it helps to ask if they use with home remodelling software. If they do, you can simply request to see their previous work and find out if they are capable of putting to paper (or the screen) the ideas that are brewing in your mind. Without further ado, here are some benefits of using 3D visualisation when renovating your home. A floor plan is a detailed layout of what your home will look like after the renovation. That sounds simple, right? In practice though, a lot of homeowners find it difficult to visualise the floor plan and how it will pan out in reality. However, with 3D home design software, you can watch the floor plan come alive. You can take a virtual tour of the entire plan and understand each and every aspect of it. The better you understand your new design, the better placed you are to make an informed decision about it. Even if you’ve conveyed your renovation requirements a dozen times, the design is not finalised unless and until you review it with your architect or designer. And there is no better way to do that than with 3D architectural planning. It allows the designer to walk you through the new design using multiple perspectives of your home or a fly-through animation. As the designer shows you from room to room, you can go through every aspect of the design and voice any questions/doubts or even make changes. With 3D visualisation, your meeting with the designer becomes more productive as changes to the design can be done in real time. Using 3D visualisation for winning approvals for architectural design plans might seem like a novel idea but it’s pretty useful. This is especially true if your home renovation can affect your neighbours in any way whatsoever. Showing a rendering of your design is a great way to allay their concerns and win their support. Home renovations are notorious for overshooting their planned budgets. However, if you dig deeper it’s apparent that most of the overruns are because of design changes made after the construction starts. The key to staying within budget, therefore, is to keep ad-hoc design alterations during construction to the bare minimum. This is where 3D home design software comes in. You can try out all design combinations using the software before settling on a final layout. And with the right contractor, you might even end up spending lesser than planned. Much of the pre-renovation excitement is down to the various design ideas sloshing around in your head. From researching the internet to browsing Pinterest boards, flipping magazine pages, and even seeking ideas from friends and co-workers, there is no dearth of ways to discover home design ideas. The tougher part is picturing those ideas in your existing space and deciding what works best. Home modelling software, on the other hand, lets you see how every design, colour and material choice will look like much before your home is subjected to any sawing, cutting, hammering, installing or painting. Thankfully, more and more architecture and design firms nowadays are mainstreaming the use of 3D visualisation. You can do your bit by asking for 3D visualisation when renovating your home and in the process, experience the aforementioned benefits.